are included in the price. 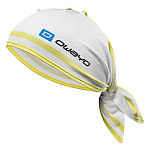 owayo Bandanas CAB5 Pro are produced from light and moisture wicking materials. They absorb and transport excess moisture outwards to dry, keeping your face sweat free. 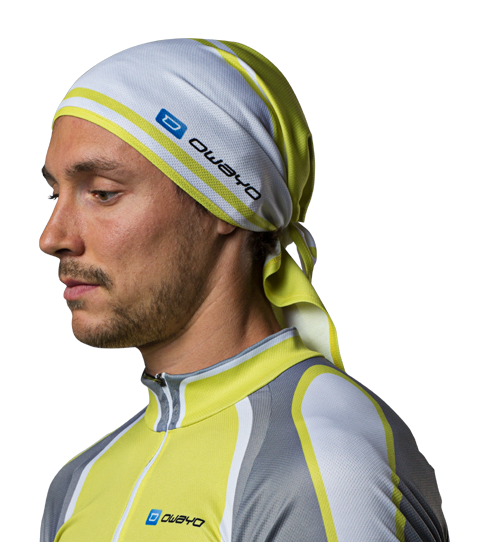 The bandana protects the skin from over cooling and from the sun. The bandana can be worn under your helmet! The CAB5 is our line of customisable bandannas/buffs. They can be ordered in triangular as well as rectangular shapes, and are the perfect accessory and small gift for any athlete. They are made of a functional material making them as light weight as possible. Trianlge Shape for perfect protection against the sun. 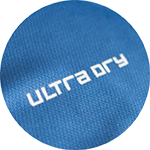 Persperation and moisture is wicked away from the body and evaporates away from the body keeping you cool and dry allowing you to maximise your performance. Looking for a design that is not available in the 3D Designer? If you would like to create your own design in a graphics program or if you would like us to implement special ideas for you, please contact our design team. Already have a draft or image of your unique design? Simply send it to us via photo, sketch or graphic layout. Would you like to order a special design that can’t be created using our 3D Designer? We will check if we can offer your desired colour in sufficient quality. If so, we will upload the colour into your account in the 3D Designer for you. The colour will be available in your account in approximately one business day. Are you looking for specific colours? We can load specific colours into your 3D Designer profile. Please select your colour system (Pantone, HKS, RAL) via the dropdown menu below and submit your username, colour value and email address. We will let you know as soon as the colour has been added. If you are interested in adding more than one colour to your profile, please reach out to us via info@owayo.co.uk and provide us your username and colour specs. Please be aware that the colour saturation and appearance on your monitor/screen is not always true to what the colour looks like when printed. The perception of colour is dependent on the device settings and thus may appear different to the final results, which is why we offer and also recommend to send your colour and fabric samples for FREE. This ensures that there are only pleasant surprises when the final products arrive. We can upload your CI colours into your 3D designer profile to ensure you can complete your design. Simply click on the button below to request your special colours. If you would like to use a particular font in your design, we are happy to upload it into the 3D Designer for you. Please email the font file (.ttf or .otf) for your desired font to info@owayo.co.uk. Be sure to include your 3D Designer username (login) in this email. In order to complete your design, we understand that you need to add your logos and crests. 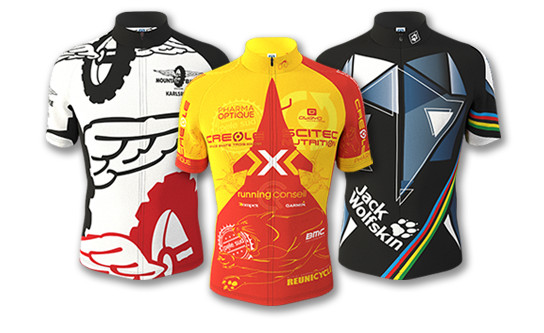 To ensure that everyone finds their place on the jersey, you can add as many multi-coloured logos to your design as needed – The cost will NOT increase. Different to many of our competitors, we do NOT flock or glue on your logos or text post production. Instead we take advantage of a complex production method that infuses the colours on a molecular level into the fabric during the production process to ensure that these will never wash out or fall off our products. The production method ensures the highest durability and also gives us the ability to print as many logos and text in as many colours to get the job done right. Our patent pending 3DDSN-Technology infuses the textile fibres with colour pigments on a molecular level. After printing, the fabric remains fully functional - wicking moisture and sweat while transferring heat away from the body. The dyed fibres on our products will always remain elastic, allowing our products to flex with your every movement. We manufacture each order to your design specifications. The colour infused fibres remain soft to touch, ensuring the highest degree of comfort. We accept almost any graphic format – We obviously prefer working with vector logos as these provide the maximum detail when printing and are easier to use; generally vector logos come in formats ending in .pdf, .ai, .cdr, .eps, .svg. Vector logos can not be uploaded directly into the 3D Designer however, which is why we kindly ask you to send us these via email(info@owayo.com - Please also provide us your 3D profile USERNAME). We can also work with high resolution pixel graphics(>150 dpi) that generally have file endings in .png, .gif, .jpeg, .psd, .tif. Most pixel format logos you can upload directly into your 3D Designer profile – If you do stumble across some trouble, feel free to reach out to us and we will find a solution to help. The price of your individual sportswear depends on the quantity ordered of a product. Prices for reorders are cheaper than initial orders. The prices for reorders can be found in a seperate table, below. Default Features: R-Tex, Triangular. For this product, you can pick between various options. The following surcharges and discounts apply per piece. We accept payment in British Pounds Sterling. Although our prices are based on the Euro, payment is accepted in GBP through a pre-determined exchange rate. Please click the blue title-box below and the price list will be converted. Due to possible fluctuations in the market, owayo retains the right to set the exchange rate accordingly. In order to receive a personalised price estimate with the exact products, features and quantity you’d like. We keep your designs on file indefinitely, so you can place reorders at any time. Reorders of small quantities are less expensive than initial orders. Different product features, for example R-Tex, Polyamide Fabric can be cumulated, when ordering at least 5 of each variation. When ordering 15 of one variation and 5 from another variation of the same product, you will receive the unit price for 20 items. For the unit prices to cumulate, you must order at least 5 of each variation. Our prices include free choice of design, colour, texts and logos – with no hidden costs. This clear cut pricing allows you to easily calculate the cost, despite having multiple inscriptions. owayo also manufactures single orders, complete with your logos, designs and colours. Small orders do have high fixed costs, yet are still possible for just one item. Standard production is approximately 3.5 weeks. A faster turnaround may also be available for an additional surcharge. Please ask to find out about our current express production capacity. When placing an order, we only accept full payment in advance either via BACS, Credit Card or cheque (for UK customers only). The Club and School Rewards Programme allows registered clubs discounts of up to 20% - without any obligations. Read more about the Club and School Rewards Programme. This product is 'one size fits all'. There is only one size available. We suggest that you order a sample to determine if you are happy with the fit.